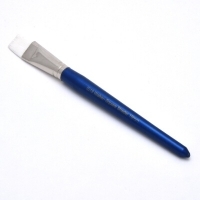 Walker Ceramics stock a very extensive range of high quality brushes. It is essential that the correct brush is used when glazing or decorating ware. 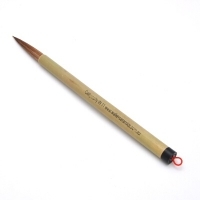 Although we recommend the following styles for glazing, they are all multi-purpose brushes. The preference of one brush over another is a matter of personal choice. A good brush is a sound investment. Any brush, no matter how high the quality, can be destroyed by bad housekeeping. Wash the brush in lukewarm water with a small amount of household detergent. This will remove any wax used to hold the hairs in place. Rinse well, and dry by standing brush head up. Don’t leave brushes sitting in water. This will eventually bend the hairs out of shape and loosen their grip in the ferrule. Rinse the brushes under running water at the end of each day. Work any colour caught up near the ferrule with your fingers. Brush hairs should always be left to dry in the shape you wish the hairs to be. Pointed Rounds: After rinsing, gently ‘wind the hairs up’ by drawing through thumb and forefinger while turning the handle in a clockwise or counter-clockwise direction. The hairs will then be shaped into a point and will dry in that condition, ready to use the next day. Squares: Squeeze excess water out between thumb and forefinger, leaving the hair shaped square. A beautiful simple brush with extremely soft goats hair suited to laying on large flat areas of colour, glaze or slips. Beautiful classic calligraphy brushes for the decoration of ware by glaze, slip or underglaze. The hair produces lively brush work and very thin lines. 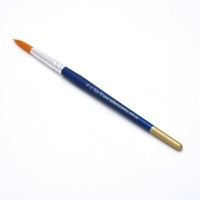 These high quality brushes are capable of holding a large load of colour yet give you complete control of application. They are beautifully constructed and have a superb life span. They are the perfect addition to any studio. 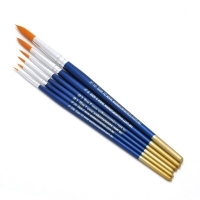 These synthetic brushes have been chosen by us for their ability to form a fine point and hold a good load of colour. They offer great resiliency at economical prices. 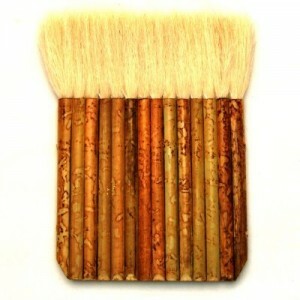 The range of sizes make these brushes very popular. White bristle hair forming a fine point. 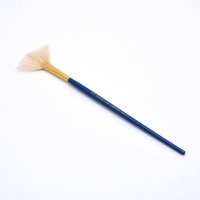 This brush covers many uses and needs in decoration – colour can be drawn from the centre of the plate out giving a focal point; or used on its edge the hairs can be shaped to give the effect of leaves on trees etc. Great for the budget conscious, these kits are perfect for the beginner and professional alike. 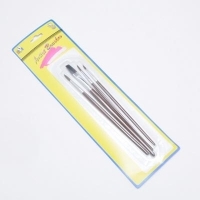 The kit comes with 4 brushes – 1 flat and 3 round. Visit our online shop to view our entire range.